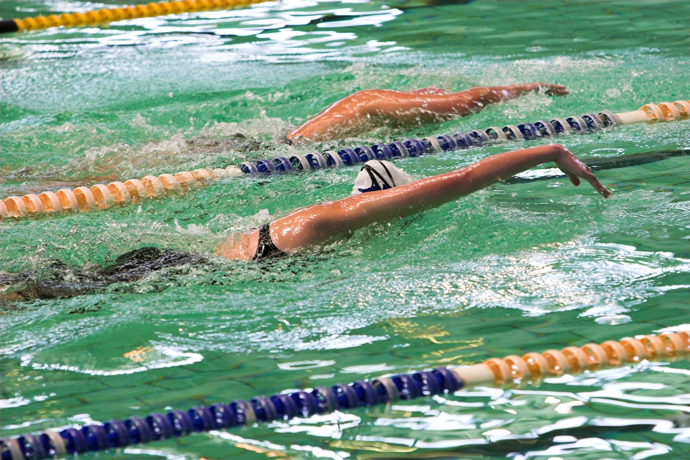 In freestyle swimming, good technique is crucial for success. 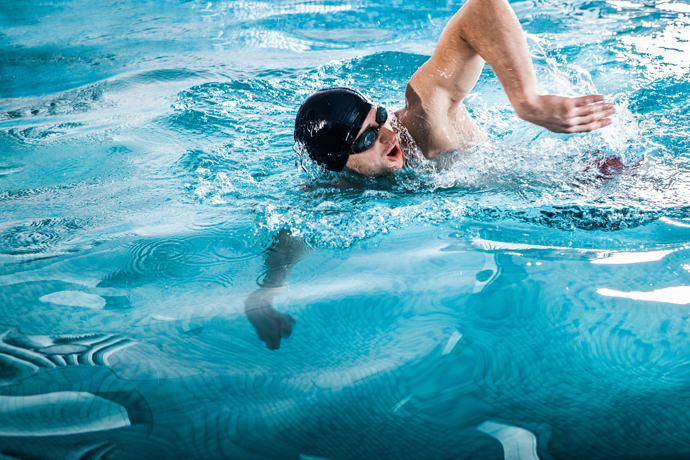 Having good technique allows you to either swim at a moderate pace in a relaxed fashion or to swim at a fast pace without getting exhausted too quickly. With these considerations in mind, we have listed a few swimming tips below to help you achieve these goals. Keep your head in line with the rest of your body and look directly at the bottom of the pool. When swimming in freestyle, many people tend to look forward rather than down. The problem with this approach is that it can cause the legs and hips to drop. As a result, you have to kick harder to keep your legs up, and you get tired faster, and you also get out of breath faster. In addition, looking forward constantly in this position can put a strain on your neck in the long run. The key to maintaining a good balance in freestyle, so that your body is horizontal and your legs do not drop, is to learn how to press your buoy. Note how this freestyle swimmer has a good horizontal balance. Her hips and legs do not drop but remain close to the water surface. By pressing the buoy, we mean that in the water, you are pushing your chest down a little all the time. Imagine your body being a seesaw. The fulcrum is located between the navel and the groin. Your upper body is on one side of the seesaw, where your air-filled lungs act like a buoy. Your legs are on the other side of the seesaw. When you push your chest down a little, your body pivots at the fulcrum, and your hips and legs move up to the water surface. 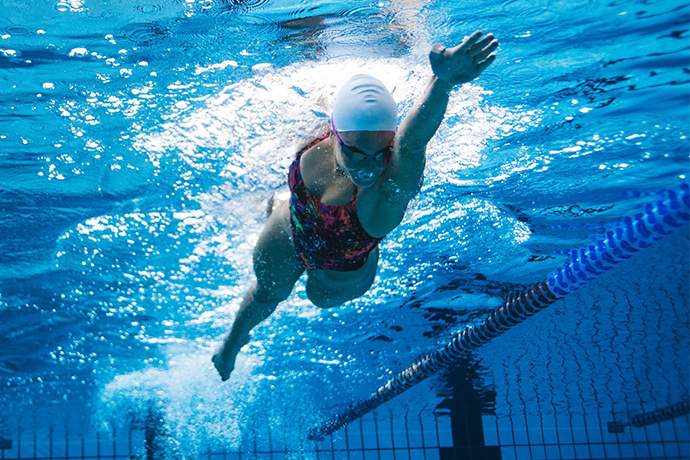 Learning this swimming technique is often a crucial step because it allows you to keep your legs up without effort and focus on other aspects of your stroke. I know people who have been triathletes for years and are good at running and cycling, but have a weakness in swimming because they don’t know this technique. Do not lift your head forward before turning sideways to breathe. This common mistake also causes your hips and legs to drop. Instead, roll to the side and at the same time turn your head a bit further so that your mouth leaves the water. This should feel like turning your head on a pillow lying on the surface of the water. Ideally, you should have one eye above the water surface and one eye under the water surface. Being able to do this takes time and practice. Roll your body from side to side over the stroke cycle. If you roll from one side to the other in this way, instead of swimming “flat”, you can activate the larger back muscles in addition to the shoulder muscles, which gives additional strength to your arm stroke. To develop an effective freestyle stroke, you need to breathe out continuously in the water while your face is underwater. The reason for this is that during the arm recovery there is not enough time to both inhale and exhale laterally. Breathing out continuously also allows you to be more relaxed than when holding your breath. Use a high elbow position while pulling your arm back in the water. A high elbow position allows you to hold a vertical forearm for a longer period of time. The technique of the high elbow is to bend the elbow and bring the forearm into a vertical position as quickly as possible during the underwater phase of the arm stroke. To keep the forearm vertical, you must keep the bent elbow as high as possible for as long as possible during the active pulling phase. By holding your forearm vertically, you increase your grip on the water and thus improve the propulsion. As you move your arm forward, do not extend it all the way above the surface of the water, only to let it drop in the water at once. Do not overreach with your recovering arm. Doing this is a bad idea as it creates turbulence in the water and additional drag. In addition, the full extension of the recovering arm above water increases shoulder strain, and can lead to swimmer’s shoulder over time. It is best to cut the water with your hand halfway between the top of your head and the span of the fully extended arm and pass the arm through at the same spot. 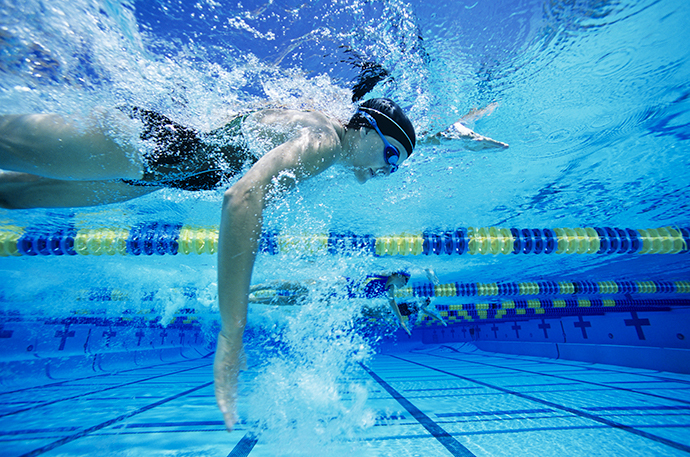 The use of a relaxed two-beat kick is ideal for long-distance swimming, as it saves energy. 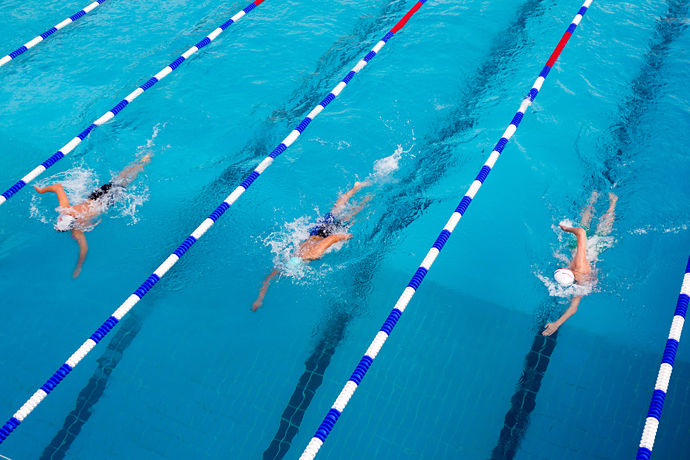 A two-beat kick is well suited for long-distance freestyle swimming. Similarly, you can be more relaxed learning the front crawl with the two-beat kick as you consume less oxygen and therefore need to breathe less often than with the six-beat kick. With the two-beat kick, you kick once with each leg over the entire stroke cycle, or a total of two times with both legs. This means arm strokes and leg kicks are in sync. With the six-beat kick, on the other hand, you kick three times with each leg over the entire stroke cycle, or a total of six times with both legs. The arm strokes are therefore executed more slowly than the leg kicks. The six-beat kick is better for short sprint races because it allows you to swim faster, but on the other hand, you can also get out of breath more quickly as the big leg muscles consume a lot of oxygen. 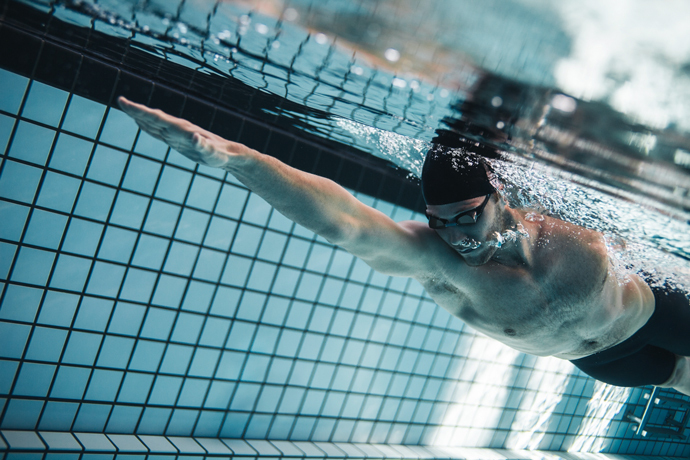 When extending your arm forward under water during the recovery, make sure to keep your hand flat and parallel to the water surface with your palm facing down. Pay attention to your hand positioning. A common mistake made by freestyle swimmers is to bend their hand upwards at the end of the recovery. When they do this, they push water forward and thereby slow themselves down. When you learn freestyle, a nose clip can be useful as it keeps water out of your nose. If you don’t have to worry about getting water in your nose, you can be more relaxed, which speeds up your progress. Once you’ve learned the basics of the freestyle technique after a few months, you can wean yourself off the nose clip. 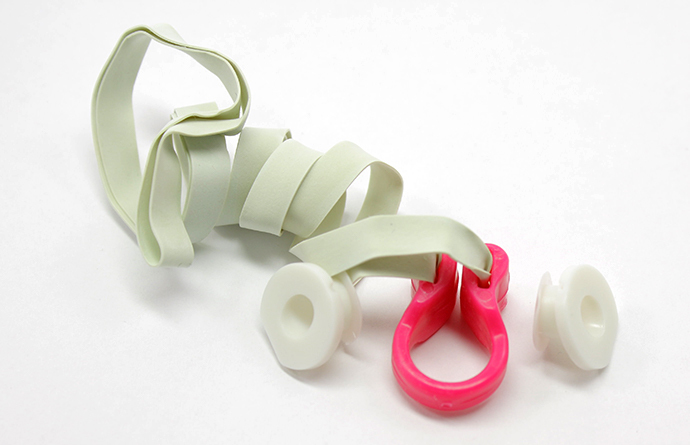 For example, I used a nose clip for a year when I started swimming freestyle, and that helped me a lot. I hope the above swimming tips will help you improve your freestyle swimming technique. Some of these suggestions can be applied immediately, while others can take some time to be put into practice, but there is no harm in trying them out. I am 55. I have been enjoying swimming freestyle for many years. I have a short video of my freestyle. I need to get advice from this video. I breathe in through the right side rotating on the left side. Then at this moment, my trunk sinks a little. It does not happen when I am on the right side. What is the reason: too much rotation on the left side? Not a full stroke catch of the left arm? Could you please write your E-mail address and I will attach the video. Many thanks in advance for comments and advice. I think you are used to the other side. 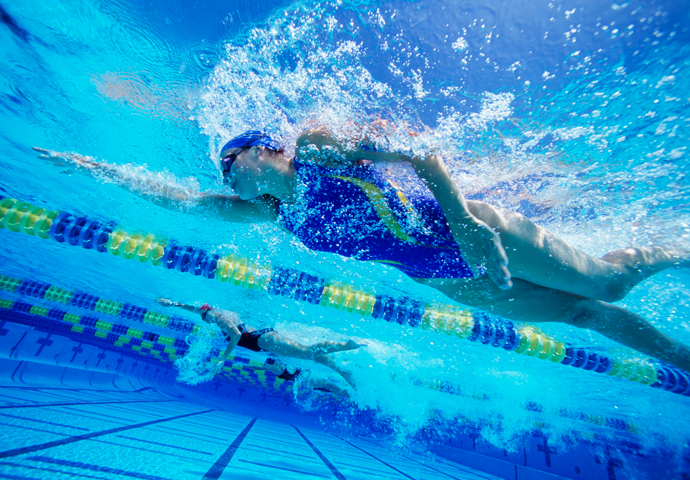 Great tips and advice on working on becoming a more effective freestyle swimmer. These techniques are certainly worth a try. Thanks for the article. Well, I do believe there is some good information in this article, but I don’t think is too helpful. You are missing some very important things plus you should put way more photos and video so we can visualize everything better. Remember swimming is a sport where you need to see for the swimmer to learn. My son is 15 and just started to participate in competitions. I have a short video of him swimming freestyle. After I saw your great videos, I know he needs to make some corrections on his technique. Could you please send me your E-mail address so I can send you his video swimming in a competition? Thank you for your support! You can just use the form on the Contact Us page and I’ll get back to you. I am a swimming instructor I would like to help you. [email protected] this is my mailing address. I’m Wendy, and I signed up for the channel swim for diabetes. This means I have to swim 22 miles in a local pool, luckily, not the channel or I would already be dead! I’m of the age when you were thrown into the pool and if you didn’t die, you were a swimmer!! I can only do the breaststroke (maybe a close copy of same) and I have realized I’m as slow as a week in the jail!! I’d love to be able to do the crawl, any tips please, 70/80 year-olds are lapping me. I really enjoyed your site. Of your 10 techniques for freestyle, I reckon I am doing only one, the underwater breathing timing, correctly. I have swum all my life reluctantly and badly as part of my overall fitness regime. I am a former top-class runner and gym instructor who at 54 years due to an accumulation of injuries it looks like my running days are over. I have hit the pool with a vengeance doing 3-5 k up to four times per week. However, this is slowly. I know I am fitter and stronger than others in the pool however they fly past me. I know I am ultra-competitive and laugh at myself. In running, I knew I was always faster than almost everyone, and it is a big fall. These techniques give me a lot to ponder and hopefully work upon. One question. I miss the burn, fatigue of a hard anaerobic type workout. Is swimming naturally self-limiting and moderating or will this change with technique? I really find it hard to push myself in the water so go for distance instead. It is indeed possible that you are held back by your swimming technique. This explains why less fit swimmers can swim faster than you. As the human body isn’t designed for swimming, we have to learn how to move efficiently in the water. This requires time, dedication, attention to detail and ideally a good swim instructor. I have been a runner for 25 years, dabbling in 10k and 20k races. I also did the swimming leg in a few team triathlons a few years ago. So I can tell you that swimming is no different than running in the regards of training intensity. 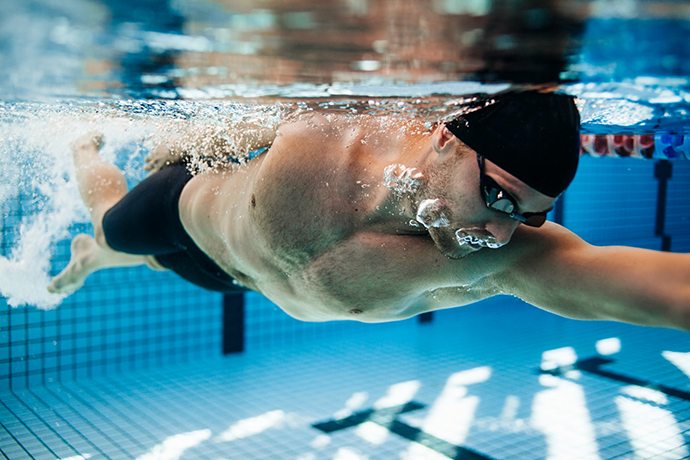 Once your swimming technique has improved, you will be able to target a certain level of intensity in your swim training without being held back by technical hurdles. Before closing, I want to add a word of caution. Swimming injuries, such as swimmer’s shoulder, are possible if you increase swimming distances quickly and/or swim with not-so-good technique. Just one thing to keep in mind. Thanks for the article. I was taught to swim by the great “Doc” Councilman who went on to become a legendary coach at Indiana and for the USA. Many of the things shared above are the same basic techniques he taught me in the 1960’s. Thanks for reminding me!